Coined ‘monster’ because it looked rather ugly when I first encountered the fruit.. This was the first curuba I cut open – unfortunately at a time before i knew what to do with it so it was not ready for consumption and had to go straight to the bin in the end. I’ve covered a few different exotic fruits before. The variety of fruits here can be rather bemusing, especially when they are not commonly found elsewhere and many of their names in at least 4 syllables. There is granadilla, maracuya, guanabana and pitaya (perhaps the easiest to remember by far!).. Indeed, there are so many of them that going to the green grocer or Paloquemao market to see the fruits is one of the worthwhile ‘tourist’ activities in Bogotá (well, another reason being that there really aren’t that many tourist sights in Bogotá compared to other capital cities). Today’s feature is Curuba. According to the mighty Wikipedia, curuba is dubbed ‘banana passion fruit’. 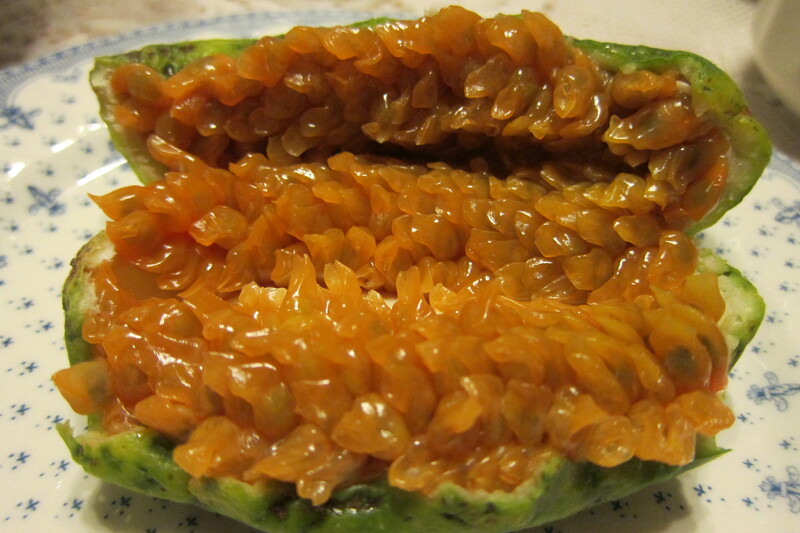 Given its acidic and slimy seed pulp, the interior does have resemblance to passion fruit. However, besides being sour, it tastes nothing quite like passion fruit. Since it’s not sweet, it doesn’t really get on people’s ‘favorite fruits list’ like mango or strawberry does. It’s very cheap though, especially during the harvest season.You could get 7 of those for USD 1, which make 4 big glasses of fresh juice by blending it with water or milk, the conventional way to consume the fruit. Curuba is soft and tender when ripe, easily bruised, so the ones you can get your hands on are usually green and raw, which can be bitter and sour. Just bring them home, wait for 3-4 days, and when they turn yellow, they’re ready to be juiced! In fact, fruit juice is a key member of the Colombian dining table and not one single meal gets washed down without fresh fruit juice. The Colombian customs are mandarin/orange juice for breakfast, lemonade (from lime) /blackberry/guava for lunch; whereas alcohol could win over juices at dinner, and unfortunately and increasingly, diabetic soft drinks like coke/sprite in the developing market. Seen to pair well with ajiaco (don’t ask me why), curuba is traditionally served with the Colombian chicken soup from Bogotá. Unfortunately for you, it looks like you did not have an opportunity to taste this fruit but only as a juice. It may be prepared in flan, ice cream, combined with other fruits in several deserts and as wonderful flavor added to a fruit cocktail.